My mom and I have decided we do not like the ‘S’ word. No, not the one you are thinking – I am referring to the one people use when referring to the loss of my brother. We also don’t like the ‘K’ verb used in explaining how he died. Maybe it’s unhealthy or a coping mechanism for us as we grieve, but for him and the adventurous life he led, we aren’t going there. Monday was World Mental Health Day. A day to have conversations about our mental well-being. A day to spread the hashtag of #healthemind. For me, since my brother passed away in January, each day is that for me. 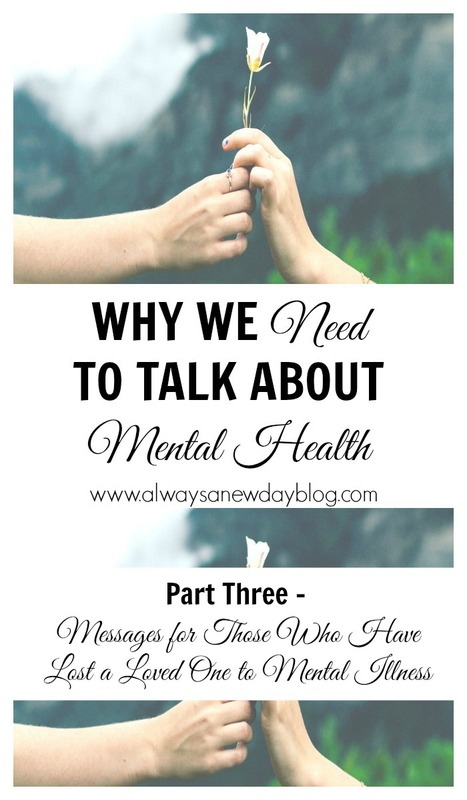 If you have read my posts on mental health, you know talking about mental health has become my passion. 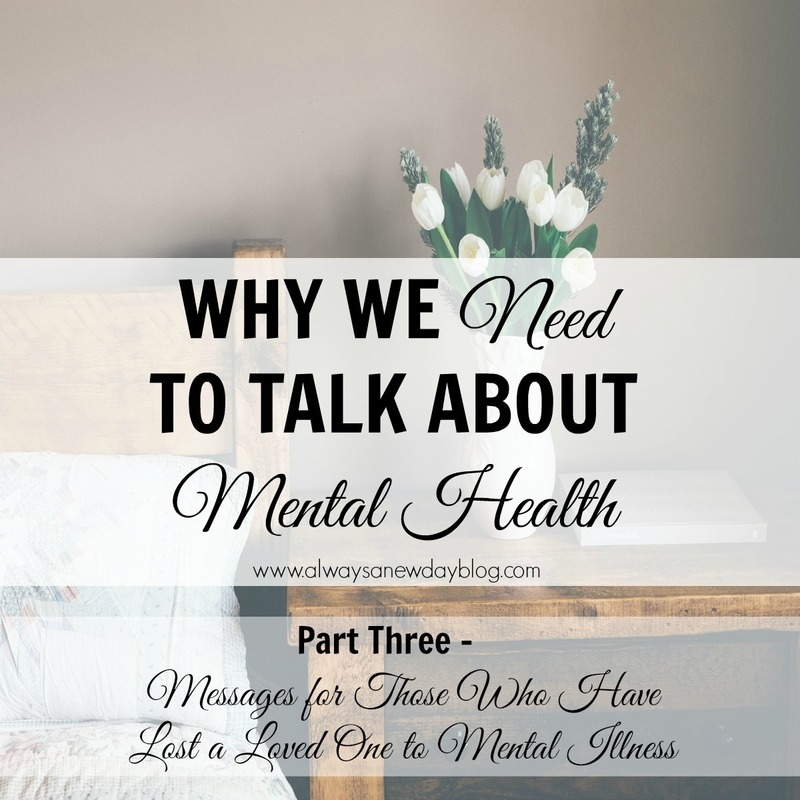 I’ve shared the why, the ways to seek help, and tips to take care of ourselves. Today, I want to share messages to those who have lost loved ones to mental illness. And if you are a friend of someone who is grieving, these messages may help you, too. I changed my wording after watching this TED talk. I eliminated the ‘S’ word and now say the honest truth – depression stole my brother. Do not call the deceased selfish or question why they did this to one person or another. Understand it is an illness; it is not a choice. Meet the grieving where they are – if they want to talk about their loved one, let them. Be open to yourself in knowing you don’t have to talk about it unless you want to. Maybe you aren't ready to talk openly about it. I believe that's your right, too. Friends should try to meet you where you are. There is not a how-to with grief because if there was, that guide would be a best seller. And, there is no timeline or expiration date to grief. You do not ‘get over’ loss – you get through day by day. Be with your friend and be patient. And if you are grieving, be patient with yourself. Encourage them to practice self-care. Take walks. Write. Get in quality time with friends. Seek help if the grief consumes you or you find yourself slipping into darker moments more often. Laugh. And know it’s okay to do so. Make your friends laugh. My brother was always the jokester so I know he would want me to crack up more. For me, those moments come from my kids. I am pretty sure my brother pushes them to make me crazy right when a sad moment comes. Connect with others who know what depression can do to loved ones. Read their stories. Write your own and share. That process for me has been overwhelmingly effective. Encourage a grieving friend to seek an outlet for her as well. Everyone’s journey is different. Everyone is on a roller coaster of questions that will never get answered. A good day suddenly turning gray. Or even a somber day ending in hysterical laughter. And there’s nothing wrong or strange about these crazy days. And remind your friend that she will get stronger. Know yourself that you will get stronger even when you feel so tired. Surround yourself with love. With light. With faith. This post is coming during a good week so if I sound like rainbows and butterflies today, I currently feel happy. But, that’s the tricky thing about grief. I could wake up tomorrow and see his picture or my son could ask about him. Then, that colorful day changes. That’s grief. Talk about mental health. Don’t let World Mental Health Day be one day. Let’s keep talking about it – and let’s keep helping each other. Share these messages with someone who may need them. Thank you for reading and sharing this ever important topic. Be blessed, my friends. I cannot tell you enough how much your words bless my soul. Thank you, Kim, for writing through your grief and your joy and all of the emotions that arise in the space between. Life is hard and hurtful, but there is beauty even in the pain. Your voice is part of the beauty, my friend. Your words are so beautiful and I know they're going to help so many people.